Brexit is the current and incredibly dangerous version of the ongoing and deeply rooted restructuring of UK health, welfare, security, and education services. Comparing the UK government reforms to public education in England with the Brexit strategy shows that there are similar processes underway. Notably education in England has, for over 40 years, experienced ‘Edu-exit’, whereby schools have either ‘left’ local democratic control or have been set up ‘independently’ outside of it. Brexit as a process of leaving and regaining independent control is not new, and has been normalised through processes such as Edu-exit. It has five features. Claims about exceptionalism and freedom as a personal property. Brexit and Edu-exit are both restoration projects. Brexit is located in the mythology of the UK’s destiny to dominate the world through an imperial past and a current desire to take back control in order to trade as a sovereign nation; Edu-exit is a restoration project located in the mythology that all parents can and should own the freedom to make choices about educational services that they need for their children, and that autonomous schools can provide ‘good school places’ for such consumerism to operate. Autonomy and exiting as the solution. Brexit and Edu-exit are both modernising and corporatising projects. Brexit is located in the advocacy of corporations as the model for governance, where organisational self-rule by CEOs enables independent operations within and outside of the nation state; Edu-exit is a modernising project, with autonomous schools modernised through entrepreneurialism and corporatised through multi-academy trusts, and in which globalised CEOs control entry and exit borders to ‘good school places’. Assertions of and lies about the dangers and failure of bureaucracy and elections. Brexit and Edu-exit are both premised on anti-democratic strategies. Brexit is underpinned by attacks on democratic EU institutions and roles, with lies about everything from the shape of bananas to the rights enjoyed by EU citizens; Edu-exit is underpinned by attacks on local democracy and local authorities, with lies about everything from local planning to education quality. Ridiculing expertise and evidence. Brexit and Edu-exit are both premised on anti-knowledge agendas. Brexit is enabled by claiming that expert evidence is ‘project fear’, the UK version of ‘fake news’, and that experts are elites operating in their own interests and worthy of ridicule; Edu-exit is enabled by downgrading professional knowledge and judgement through training rather than education, by replacing teaching and learning with data collection, by requiring control through charismatic entrepreneurial leadership, and by dismissing biased research from the ‘blob’ who are the ‘enemies of promise’. Brexit and Edu-exit both use the ‘there is no alternative’ (TINA) premise as the means of encouraging people who will be damaged by the reforms to accept or even campaign for them. Brexit is enabled by people voting on and sustaining that decision over time in ways that are contrary to their interests; Edu-exit is enabled by the profession accepting corporatised identities and practices, parents accepting consumerism, and children accepting data production in order to demonstrate that they are worthy of one of those ‘good school places’. I have experienced and studied the reform of public services education in England and globally for the past 40 years, and when I hear the pro-Brexit arguments I hear what has already become ordinary through the radical reforms of education from Thatcher onwards. For example, the idea of autonomy is based on either leaving public control through (from 1988) grant-maintained status or (from 2000) academies, or setting up schools that are independent and free from public control as city technology colleges, studio schools or free schools. My colleague Steve Courtney has mapped all of this and has identified that there are now between 70 and 90 different types of school in England. quality is determined by particular types of numbers that demonstrate whether a child is worthy to go to that school, and whether ‘good school places’ are on offer or the school should close. Parents and communities are now navigating a shopping mall of schools in which school-place businesses are opening and closing. There are now reports of children who have gone through the closure of at least two schools, leaving them without a school place. One response is to engage with a form of hyper-consumerism in how parents and children invest their savviness and muscle in the demand for a good school place. Another response is to give up, and hence confirm the Edu-exit eugenics claims that not all children are educable or aspirational for social mobility opportunities. Brexit and Edu-exit are both militant anti-state and anti-democracy projects, in which the aggregation of privatised leaving opportunities are the automatic reform and reward solutions for those who will benefit from private profit. It is not that people are ‘bored of Brexit’ (BOB), even though they have heard the same arguments before. The point is that Edu-exit has ensured that there is nothing to talk about and, seemingly, there is no point in talking about it. Helen Gunter is professor of educational policy in the Manchester Institute of Education, University of Manchester, UK. 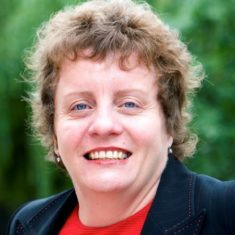 She is a fellow of the Academy of Social Sciences, and a recipient of the BELMAS Distinguished Service Award for 2016. Her work focusses on the politics of education policy and knowledge production in the field of school leadership. Her most recent books are An Intellectual History of School Leadership Practice and Research (Bloomsbury Press, 2016); Consultants and Consultancy: The Case of Education, co-authored with Colin Mills (Springer, 2017); and The Politics of Public Education (Policy Press, 2018).